With help from her dashing but mischevious friend Flynn Rider Rapunzel escapes from her tower and together they explore the kingdom. 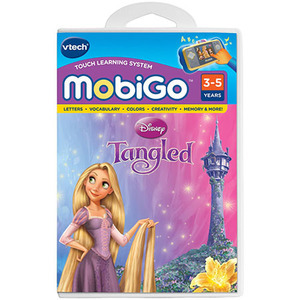 In this new game from VTech MobiGo will Rapunzel's dream of seeing the floating lights comes true? Best suited for children ages 3-5 years kids will be engaged as they learn about colors and letters all while growing their abilities in memory logic and creativity. Five learning games can be played in any order. Wide variety of motions can be used in touch screen play. Curriculum includes colors memory letters logic and creativity. Features real voices of Rapunzel and Flynn. Colorful characters and backgrounds make learning fun.